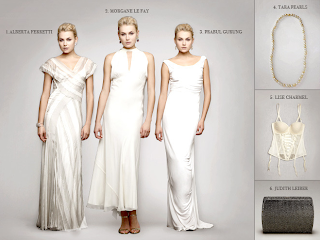 Wedding dresses, jewelry, accessories, lingerie, and suits from designers like Alberta Ferretti, Vera Wang Collection, and Hanky Panky. Bridesmaid, mother of the bride, and flower girl dresses, jewelry, and accessories, plus beauty for everybody, all grouped by color. Day Three: Honeymoons and Experiences Dream honeymoon packages on Jetsetter, makeup artist and food packages on Gilt City, and diet and beauty packages from Clean and Completely Bare. This is a bit of a stretch, since you can't exactly register for any of it, but you can at least treat yourself to china, crystal, stemware, candles, and bedding from brands like Frette, Michael Aram, and D. L. and Co.
What's more, Gilt is running a sweepstakes for the next Gilt Bride. To enter, upload your favorite picture of yourself & your betrothed with a paragraph explaining how you'd make your wedding Gilty. The winner will be crowned Gilt’s style ambassador for their next wedding event and, more importantly, will win a dream honeymoon worth $5,000. The contest starts tomorrow, 10/20, and runs through 11/10. Of course, you need to be a Gilt Groupe member to partake of all this awesomeness. 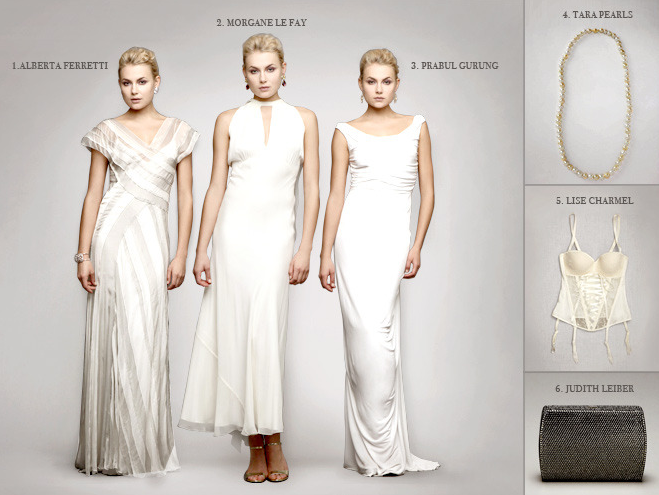 If you're already a member, you can access everything at www.gilt.com/theweddingshop. If you're not yet a Gilt member, join here (it's free!). I haven't been this excited since the first Alexander Wang sale on Gilt! Gilt is a great site for those that want nice clothes at good prices. If your go-to outfit is an undershirt and basketball shorts I don't think you'll like the site, but you never know. I hope you enjoy the site, don't let yourself get carried away! Wow! I am so pleased to know about this wedding sale. My sister is getting married at domestic garden venues Chicago and she has a tight budget so these kinds of sales would be helpful for her. If you know about recent sales in Chicago then please let me know.